Dec. 18, 2014, 10 a.m. In October the Austin-based news nonprofit ended a collaboration with The New York Times. Now the Tribune and the Post will share stories and co-sponsor events. By Justin Ellis @JustinNXT Dec. 18, 2014, 10 a.m. The Texas Tribune is taking its split with The New York Times pretty well. Two months ago the Times ended its story-sharing agreement with the Austin-based news nonprofit after four years. Now, the Tribune has a new dance partner: The Washington Post. The Post and The Texas Tribune will begin a new partnership in January that will see the news outlets sharing stories, swapping data visualizations, and teaming up to hold events based on the news. For the Post, this gives the paper a new source of reporting on Texas politics and continues the digital expansion strategy that has been one of the hallmarks of the Jeff Bezos era. For the Tribune, the partnership provides a new home for their reporting outside the state of Texas. And, in a more practical sense, it’s providing at least one Tribune reporter a home; the nonprofit’s new Washington, D.C. bureau chief, Abby Livingston, will work out of the Post newsroom. “When The New York Times partnership ended we saw an opportunity to pursue another teammate,” Texas Tribune editor Emily Ramshaw told me. A few phone calls between Austin and Washington, and the partnership was in place, Ramshaw said. The two already had an informal relationship, with the Post running Tribune stories and collaborating on the Post’s TruthTeller, a project that fact-checked speeches from politicians. But as the 2016 presidential election quickly approaches, with a handful of Texas Republicans as potential candidates, the Tribune will be a valuable partner in covering the race for the White House, Baron said. Content partnerships are becoming a common strategy at many news organizations that are trying to create an invaluable bundle of local and national news for readers. In March, the Post began a national partnership program with local newspapers around the country, offering subscribers to papers like The Minneapolis Star Tribune, The Toledo Blade, and the Honolulu Star-Advertiser free digital access to Post stories. The Post has also expanded its national reach through a new print-insert aimed at Sunday papers. As part of the new agreement, Tribune members who donate over $250 a year or subscribe to the Texas Weekly newsletter will also get a digital subscription to the Post. The Tribune also struck content deals with the Times as well as the San Francisco Bay Citizen, and the Chicago News Cooperative. Those partnerships ended in 2012, leaving the Times as the Tribune’s sole publishing partner until this fall. Under that agreement, the Tribune provided a two-page Texas edition to the Times with stories from reporters on politics and policy out of Austin. The partnership came to an end in October, the result of the cutbacks and staff reductions currently underway at the Times, according to Tribune CEO Evan Smith. 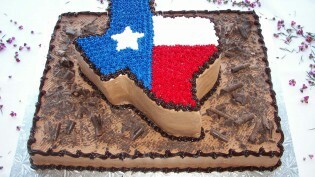 The Texas Tribune is 5 years old and sustainable. Now what? The new partnership with the Post comes as the Tribune tries to chart a path to a broader readership of people interested in Texas politics. The opening of the D.C. bureau was announced last month, made possible through funding from the William and Flora Hewlett Foundation. Ramshaw said the collaboration will put the Tribune’s journalism in front of a new readership that includes Texas expats and politicians in D.C. “What this does at the end of the day is it exposes more Tribune reporters and on-air producers to a brand new audience,” she said. On the business side they’re also eager to explore co-sponsored events; Baron told me their goal is to host a debate of presidential primary candidates. The Tribune has enjoyed success with its events business, including the annual Texas Tribune Festival, which has featured Post reporters on panel discussions, Ramshaw said. While the partnership will help the Post add more coverage of the Lone Star state, the paper is also eager to extend its reach through digital. In an interview with Business Insider’s Henry Blodget last month, Bezos said his goal is to help the Post grow from being a local news product to something that has a much broader scope. 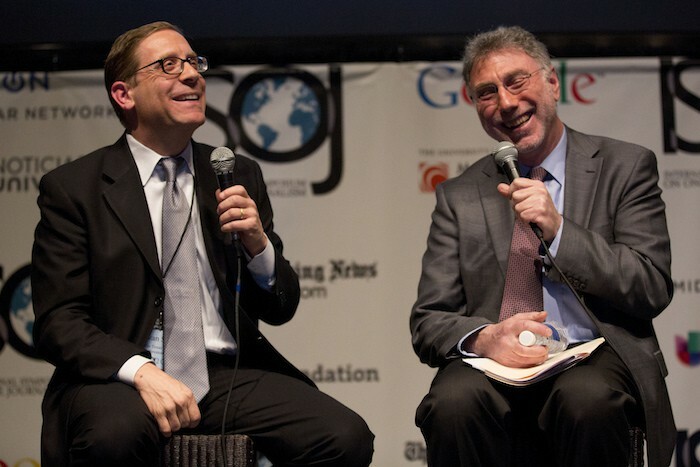 Photo of Evan Smith and Martin Baron at the 2014 International Symposium on Online Journalism by Brian Winter of the Knight Center for Journalism in the Americas. POSTED Dec. 18, 2014, 10 a.m.
Ellis, Justin. "New friends: The Washington Post and The Texas Tribune enter into a new reporting partnership." Nieman Journalism Lab. Nieman Foundation for Journalism at Harvard, 18 Dec. 2014. Web. 18 Apr. 2019. Ellis, Justin. "New friends: The Washington Post and The Texas Tribune enter into a new reporting partnership." Nieman Journalism Lab. Last modified December 18, 2014. Accessed April 18, 2019. https://www.niemanlab.org/2014/12/new-friends-washington-post-and-texas-tribune-enter-into-a-new-reporting-partnership/.